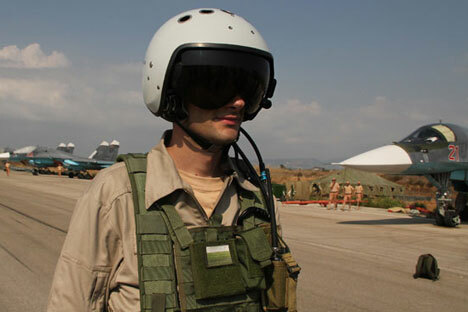 Russian pilot of the Su-34 at the air base, "Hmeymim" in Syria. The Russian Aerospace Forces unit deployed in Syria has destroyed over 1,600 terrorist infrastructure facilities over the month that has passed since the start of the operation, Col. Gen. Andrei Kartapolov, chief of the main operational department of the Russian armed forces General Staff, said on Oct. 30. "One month has passed since the start of the Russian air group's actions in the SAR and it's time to sum up some results. Our planes have carried out a total of 1,391 sorties and destroyed 1,623 terrorist sites," Kartapolov said. These sites include 249 various command and communications centers, 51 terrorist training camps, 35 plants and workshops, where terrorists assembled explosive devices, 131 ammunition and fuel depots, 371 strongholds, and 786 field camps and various bases, he said.